On Thursday we walked south along one of our favorite avenues in the 15th arrondissement, Félix Faure. Many times we've passed this amusing sign on a computer store -- another misguided attempt to use English. You can see why we ask for menus in French when someone hands us menus in English. 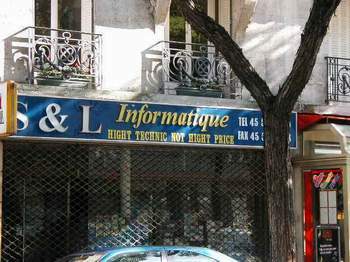 The French is easier to understand and is clearer than pseudo-English. 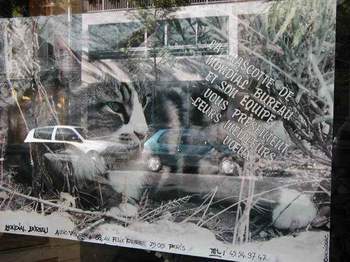 Also many times we've passed this poster in the front window of an audio visual production agency. 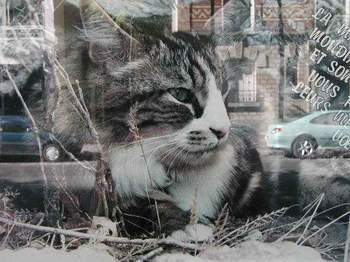 Unfortunately, the office is always closed when we go by, so we've never seen the real feline although all of her toys and favorite places to sit are right there, beneath the poster, in the front window. Fans of General Burnside will understand why we are so taken with his twin sister. Someday, we hope to meet "la mascotte" of the Mondial Bureau. Parc André Citroën is huge. 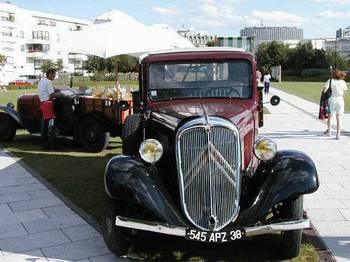 It is the site of the former Citroën truck and automobile factory. 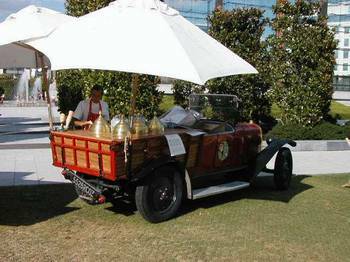 Appropriately, there are a couple of old Citroëns being used here as places for selling refreshments and renting lounge chairs in the park. "Location" is the word for rental -- also used in real estate. 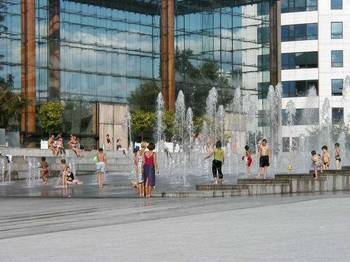 One of the most popular attractions in this park on a warm summer day is the computer-controlled fountain. The water spouts go up and down, sometimes disappearing, then reappearing -- causing many squeals of delight. Note the very modern architecture all around the site. 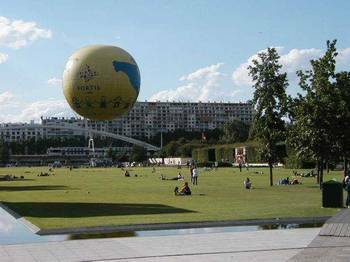 In the middle of the park, a hot air balloon takes tourists up for a view of Paris. 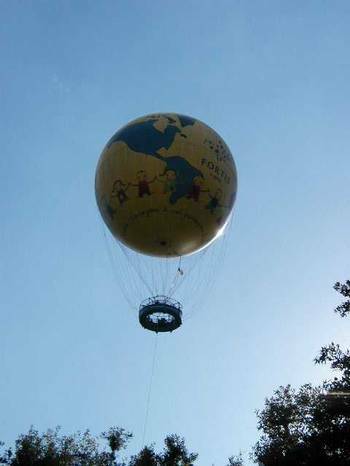 The balloon operates every day, weather permitting. We see it from our balcony at our apartment. The middle of the park is a large open space, with the dancing fountain at one end and the Seine at the other. Skirting all around the open space is a shallow rectangular pool of water. Water appears, disappears, and reappears throughout the park. 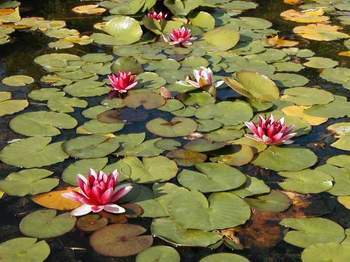 These lilies were growing in a shallow pool at the edge of the open area, near the gardens that I'm about to show you on the next page. 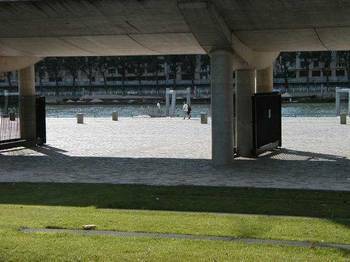 I know this isn't a really attractive picture, but I wanted to point out how they dealt with the potentially obnoxious features at the Seine end of the park. There is an expressway that goes along the Seine here. They buried it -- it is in a tunnel under the cobblestones that pave this quay. Tourist boats stop here at the quay regularly -- it is one of the best places to catch a boat that will give you a guided, round-trip tour of the Seine and Paris. 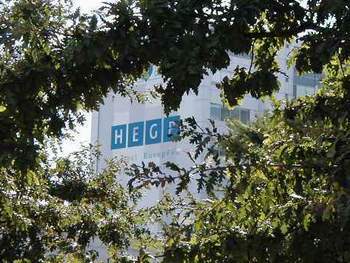 There is also an RER (commuter) train that goes along the Seine here. 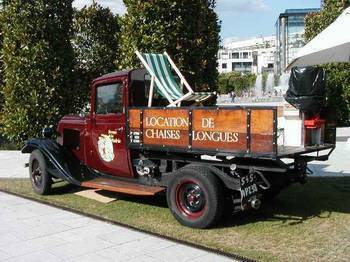 It is elevated, so that the quay is completely accessible to people who use the park.